If you’ve been cycling or walking through forest recently you may have picked up an often quite strong scent of garlic in the air. In season between late winter and spring, wild garlic (also, ramsons or bear’s garlic) grows in prodigious quantity in damp, deciduous woodland. It can be identified not only by its garlic-like scent, but also by its distinctive lush green leaves and pretty white petals. 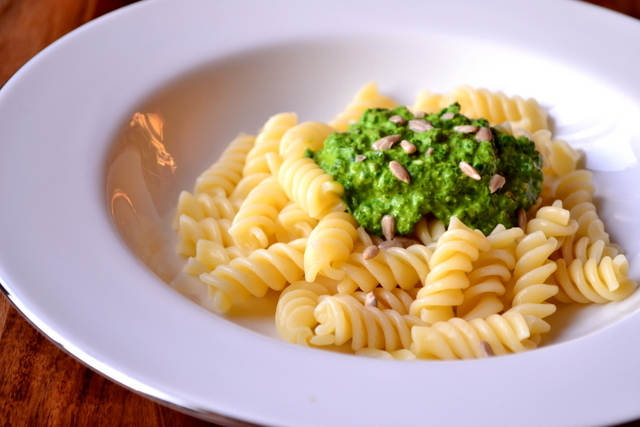 If you can get your hands on some, and I’d be surprised if there isn’t any nearby, then it has many culinary applications, chief among which is Wild Garlic Pesto. Though certainly garlicky in taste, the flavour of wild garlic also bears similarities to other members of the allium genus, particularly spring onions. As such, though delicious this pesto recipe packs a real punch and though this is slightly mitigated by the addition of cream cheese, it’s a good idea to let it mellow for 24-hours before enjoying. Though, of course, this isn’t a necessary step if you’re in need of a quick, cheap meal! Though common in the extreme, it may be that some of you simply don’t have the time, inclination or desire to go in search of wild garlic. If that’s the case and you’d still like to attempt this rather delicious recipe there are alternatives. 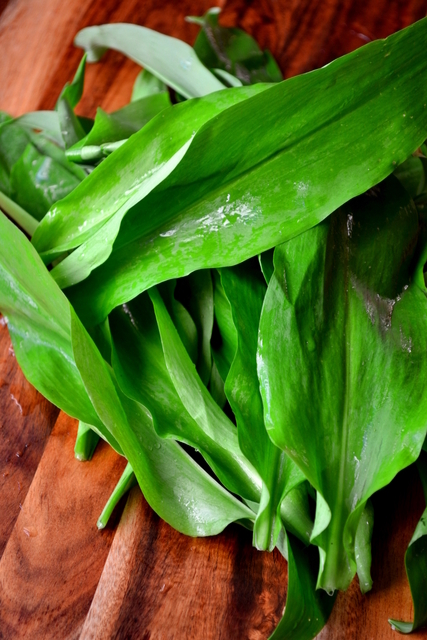 Probably the best option here is to replace the wild garlic leaves with spinach and add a clove or two of standard garlic to achieve the correct kick. We won’t frown – honest – not everyone has woodland on their doorstep, or easy access to it even if they do. 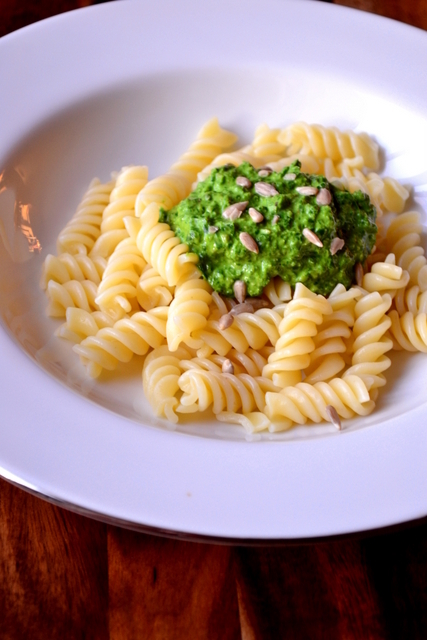 Just do what you can to enjoy my delicious recipe for wild garlic pesto. Remember, it’s not only the leaves of wild garlic that are edible – give the bulbs a try too. Though not as flavourful, they make an excellent addition to salads. It’s best to use the entire plant anyway. Gently toast your sunflower seeds until golden brown. Tip the wild garlic, toasted seeds, oil and lemon juice into a food processor and blend until smooth. Transfer the pesto into a large mixing bowl and beat through the cream cheese. Cover and leave to mellow for 24-hours (though this isn’t necessary). Serve on a bed of pasta (allow 80-100g per person) with a scattering of sunflower seeds. Cost: The best part about foraging your own food? It’s free. The ultimate in frugality. 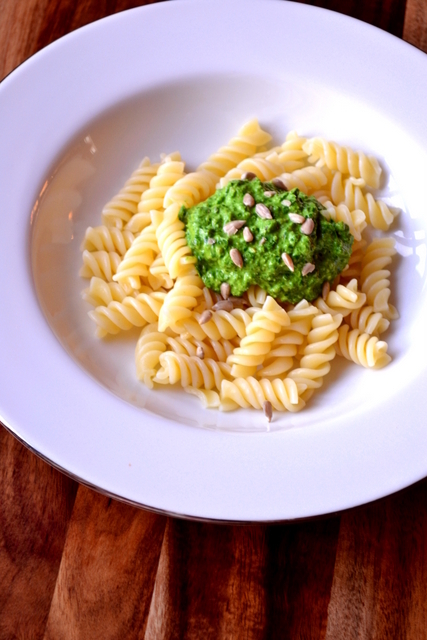 As such, this wonderful pesto should set you back around 80p. Yes, that’s 80p for around 8 portions! Including the pasta you can expect that to rise a little, but still – a bargain. I never thought of adding cream cheese, sounds creamy delish!! Just takes the edge of a little! Didn’t even know wild garlic existed, I’m definitely keeping my eyes open for some on my upcoming trek through the Stockholm forest, do you know if it grows here also? I’m not sure, but it looks like the sort of forest in which it would grow! Yum. I whipped up a quick pesto with carrot tops/greens I had lying around last week. So easy and so delicious. Exactly – a nice, fast meal of an evening. Wild garlic is all the rage in Denmark. Noma (4 times worlds best restaurant according to Restaurant Magazine) is a strong proponent. If you pick it yourself, don’t mistake it for “Lily of the valley”, Convallaria majalis. Believe me, it has happened. Yes, avoid that one – very poisonous, but once you know the difference they are quite distinct. I’m glad it’s being used everywhere though. Great recipe! I love garlic! I don’t know that I have seen wild garlic growing in Florida, but I did plant some regular garlic in my garden. I never thought about using the greens in pesto, though. I plan to make basil pesto later this summer, maybe I’ll add some of the greens from my garlic to it. Thanks for the idea! Great idea! That sounds delicious – let me know how it works out. Yes, I suppose it does. But there is a similar plant that’s actually poisonous, so look it up!